Stock photo of The Assiniboine River Marina and the Market and Tower at The Forks, a National Historic Site in the City of Winnipeg, Manitoba, Canada. 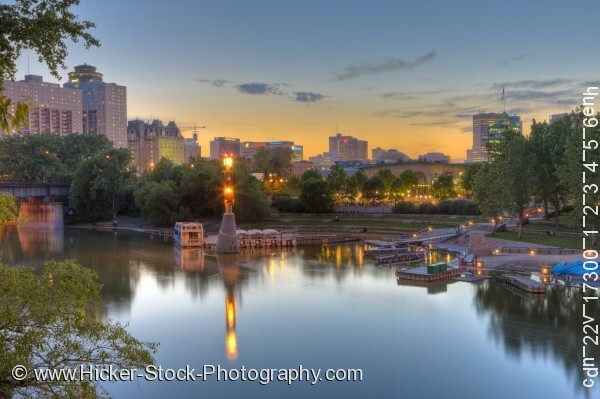 This stock photo is a beautiful scene captured at dusk of The Assiniboine River Marina and the Market and Tower at The Forks, a National Historic Site in the City of Winnipeg, Manitoba, Canada. The Forks is Winnipeg's most popular tourist attraction. It has been a meeting place for 6,000 years. Eighty year old railway stalls were converted to shops and restaurants in 1987 and a 6 story glass tower and observation deck were built. This stunning scene of sky, buildings, trees, and water with the orange glow of sunset in the lower sky is reflected onto the still waters. Built at the junction of the Red and Assiniboine Rivers, this 20 million dollar 9 acre site, is a joy to all.